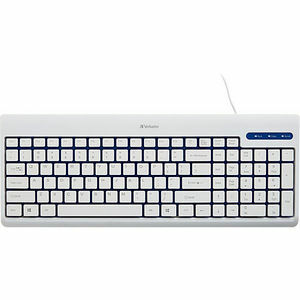 Featuring a space-saving, contemporary design, the Verbatim White USB Corded Keyboard is lightweight, and equipped with features designed to provide a quality typing experience - at a great value. The keyboard features adjustable tilt legs for quiet, comfortable typing, full-size function keys and a full numeric keypad for efficiency when entering numbers or formulas. Don't worry about running out of battery life; the White USB Corded Keyboard connects to your PC via a USB cable. For added convenience, drain holes in the base of the keyboard allow for easy cleaning.